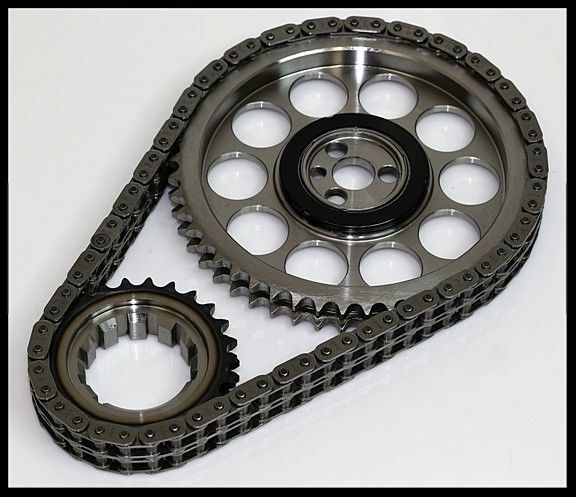 PBM RACE BILLET TRUE ROLLER TIMING CHAIN AND GEAR SET WITH TORRINGTON BEARING. FITS BBC CHEVY 454 496 FLAT NOSE CAMS OR RETRO STYLE ROLLER CAMS. This timing set is not for use on engines using an oe step nose cam. See our listings for other versions of this for use with step nose cams. The picture above is a file photo. Actual item may appear slightly different. FITS SBC FLAT NOSE CAMS ONLY. FOR THOSE NEEDING THIS SAME HIGH QUALITY SET FOR AN OE STEP NOSE STYLE CAM, SEE OUR OTHER LISTINGS. This timing set if manufactured by SA Gear. This is a premium timing set as compared to any of the low cost versions on the market. The upper gear is cnc'd from billet steel. The lower gear is induction hardened and has 9 key ways. 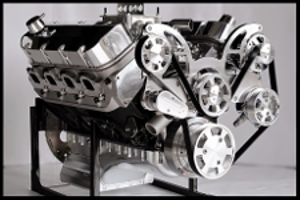 We use the PBM timing sets in all of our high performance engines. The PBM timing sets are hand matched for perfect sizing. Low cost sets are not size matched to precision. This can affect valve timing to a great degree, and create excessive wear of the chain and sprockets. This timing set also has a torrington bearing. We consider this a valuable feature. Timing sets that don't have this feature will have an excessive amount of drag as the upper gear is pulled against the block when accelerating.